Faced with the rising risk of deflation in the euro zone, which has been reinforced since mid-2012 by the continued appreciation of the euro against other currencies, the heads of the European Central Bank have begun to change their tone in their communications with the financial markets: they are now evoking the possibility of conducting a new round of quantitative easing. These measures are likely to lower the exchange rate of the euro. This would provide valuable support for the euro zone economies by shoring up their price competitiveness vis-à-vis competitors outside the zone, in a context where fiscal consolidation policies will continue to dampen the growth expected in the zone in 2014 and 2015. What are the likely consequences for the French economy from reducing the euro’s value against other currencies? We briefly review past episodes of exchange rate changes, and then present the impact expected from a 10% depreciation of the euro against other currencies using the emod.fr model. These effects are more moderate than those projected by the government. Quantitative easing measures have been used extensively by the US Federal Reserve, the Bank of England and the Bank of Japan. Since mid-2012, the balance sheets of these three banks has continually increased, by respectively 6.5 percentage points of GDP, 1.3 GDP points and 15.3 GDP points. During this same period, the ECB balance has on the contrary declined by 8.4 GDP points. This difference in strategy has led to a continued rise in the strength of the euro: now at 1.38 dollars, the euro has seen its value against the dollar increase by 12% since June 2012. 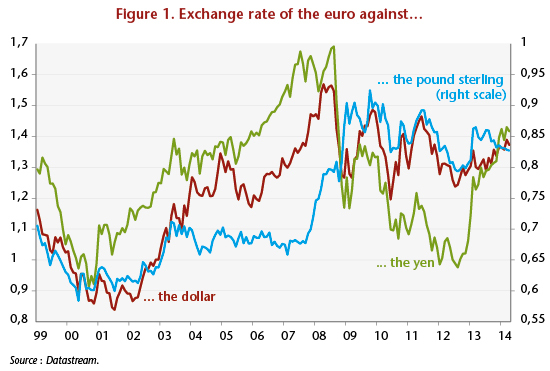 During the same period, the single currency has appreciated 49% against the yen and about 3% against the pound sterling (Figure 1). 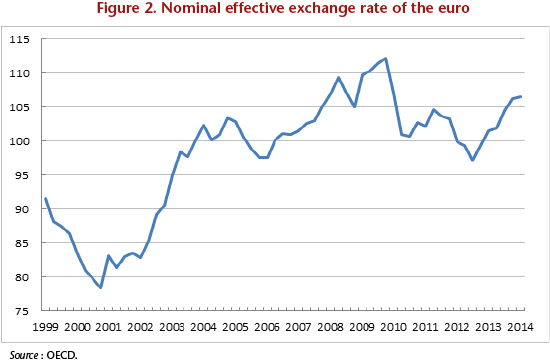 The nominal effective exchange rate of the euro, which weights the different exchange rates depending on the structure of trade in the euro zone, has thus appreciated by 9.5% since the third quarter of 2012 (Figure 2). This appreciation, combined with austerity policies and the competitive disinflation carried out within the euro zone, has held down GDP growth in the zone, which was negative in 2012 and 2013, as well as inflation. The absence of inflationary pressures and the past appreciation of the euro have now given the ECB leeway to try to influence the course of the euro against other currencies. What would be the impact of a devaluation of the euro against all currencies? – A substitution effect: a weak euro would decrease the prices of exports and increase their volume. Depreciation would also decrease the competitiveness of rival manufacturers, causing a decline in imports in favour of domestic production. These opposite effects would apply only to trade outside the euro zone. Trade with our European partners would not be directly impacted, as the prices of imports and exports to and from this area would remain unchanged. On the other hand, intra euro zone trade would be impacted by a weaker euro. But this involves the channel of addressed demand. As is summarized in Table 1, a 10% depreciation of the euro against all currencies leads to a gain in price competitiveness for French exports vis-à-vis the rest of the world. Other countries in the euro zone would benefit from the same gain in competitiveness across all export markets. In this case, the impact on activity would amount to 0.3% in the first year, 0.5% after three years, and none after nine years. The increase in demand due to this improvement in the activity of our European partners would be broadly offset by a reduction in demand addressed to France from the rest of the world. As for the labour market, this depreciation would create 22,000 jobs in the first year and 74,000 jobs after 3 years. The public deficit would in turn improve by 0.3 GDP point within 3 years. These results, while more moderate than those published by the DG Treasury, are nonetheless significant and are welcome in an economic situation like today’s that is marked by sluggish growth and the risk of deflation. A depreciation of the single currency would also undercut the process of competitive deflation engaged in by countries in the euro zone. The publication of the DG Treasury argues that a 10% decrease in the effective exchange rate of the euro (against all currencies) would do the following: increase our GDP by 0.6 percentage point of GDP in the first year and 1.2 GDP points after three years; create 30,000 jobs in the first year and 150,000 jobs within three years; and reduce the government deficit by 0.2 GDP point in the first year and 0.6 GDP point after three years.